Cleveland Gardens was laid out in c.1855 when the formerly rural area was being developed as part of the Paddington Estate. The garden was entirely refurbished in 2006, the work undertaken by the Residents' Association with the help of grants from EH and WCC. The scheme reinstated traditional Victorian railings to replace the old chain link fencing, paths were reformed and edged, and the garden was replanted. 3 notable London plane trees remain from the earlier garden. A condition of the grant aid was that the garden had to open to the public on 21 days a year. Land to the north of Hyde Park was for centuries farmland owned by the Church of England, the area known as Tyburnia after the river Tyburn that flows underground. It was at Tyburn Gallows at Marble Arch that public executions were held until 1783. The development of the Bishop of London's large Paddington Estate began after that, with an early masterplan drawn up by Samuel Pepys Cockerell (1754-1827), the estate surveyor, possibly begun in 1805 although little was built until the 1820s. Cockerell was succeeded as estate surveyor by George Gutch (c.1790-1874), who modified and intensified the layout, and drew up his 'Final Plan of Tyburnia' in 1838. The Bayswater area was developed by a number of different speculators, although some of the earlier field boundaries, footpaths and tracks from the previous land use can still be traced. A roughly triangular area between Bayswater Road with Cleveland Gardens at the apex was developed by Henry de Bruno Austin. Cleveland Gardens is the small sister garden to Cleveland Square (q.v. ), which is located 75m to the south. 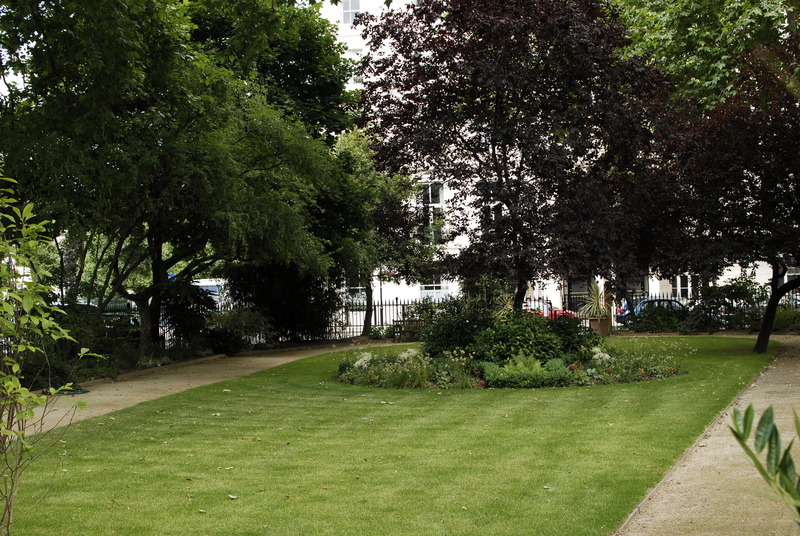 Cleveland Square or Court was the name given to the courtyard in front of Cleveland House. In 1928 the garden of Cleveland Gardens, still owned by the Paddington Estate Trustees, was for the use of residents of adjoining houses and managed by a Committee of occupants. The expenses of maintenance were assessed proportionately on each house, although the Trustees had the power to undertake maintenance in cases of neglect. It was described in 1928 as 'an oblong enclosure attractively laid out as a lawn, with flower beds and a few trees. Overlooked by dwelling-houses'.